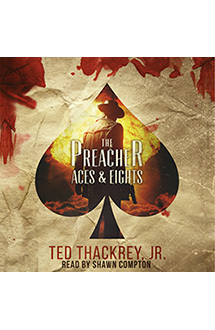 The Preacher is playing the highest stakes poker game ever dealt. His opponents are mobsters, arms dealers and terrorists. The jackpot is an atomic bomb. And if he loses, the entire city of Las Vegas will be dealt the Dead Man’s Hand. It’s non-stop action and suspense featuring the most original hero in crime fiction. The nuclear noir sequel to the sensational novel THE PREACHER, a finalist for the Edgar Award from the Mystery Writers of America.